I don't really use blusher, lipstick is a good alternatives that solve the problems of unmatchable lips and cheek colour. I am not always a blusher person, but I just couldn't stand limited edition products, especially such a pretty one. I remember seeing the product on poster, by the time I asked, it is out of stock. I basically lost hope until I found it in Chanel Gurney Plaza. The exclusive creation of the Spring 2015 collection: COLLECTION RÊVERIE PARISIENNE. A romantic blush with irresistible charm to sweep over cheekbones like a springtime breeze. Slipped into a pouch, the black lacquered case highlights a delicate powder and reveals a raised camelliamotif. A duo of pinks, one delicate and one more intense, recalls thedelicate grace and purity of the favorite flower of MademoiselleChanel. It makes cheeks blush with all the freshness of spring. Powder formula with a soft, fine and silky texture. 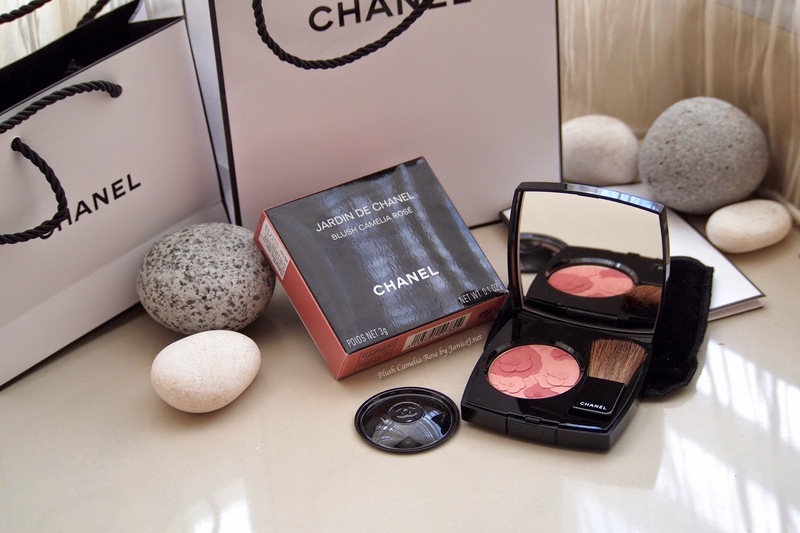 I am happy to have this blusher as my first product from Chanel. 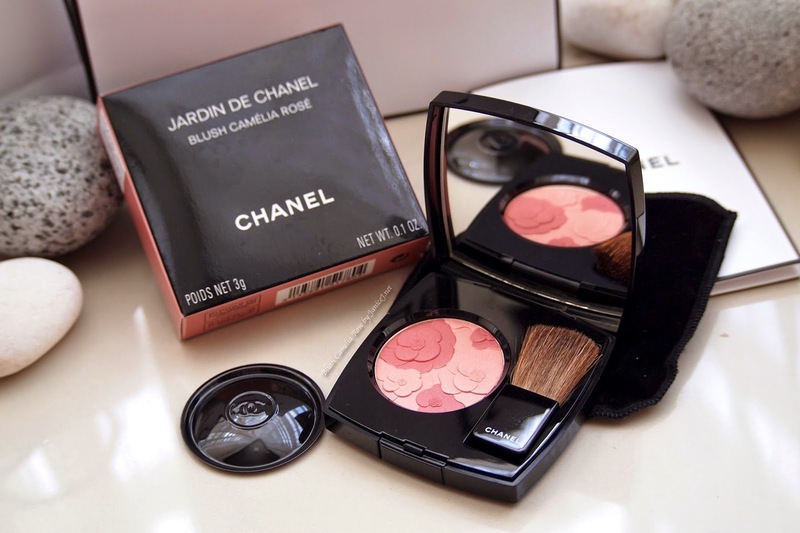 Named JARDIN DE CHANEL BLUSH CAMÉLIA ROSÉ 151,780, I believe that 90% of people who bought this were attracted by the beautiful raised Camelia motif. I love love love the packaging, colours and sleek feeling of the product. Therefore, I decided to do swatches in this blog post. I love how the blush colour change under both white and warm lighting. Also, it comes with heavenly smell! Just like the previous Spring 2014 Sakura blusher. Back of the box writes Pink Harmony Powder Blush with Brush. The ingredients are talc, polyethylene, magnesium stearate, synthetic fluorphlogopite, paraffin liquidum (mineral oil), perfume (fragrance), methylparaben, silica, lanolin alcohol, magnesium myristate, serica (silk powder), propylparaben, peg-8, tocopherol, tin oxide, ascorbyl palmitate, bht, ascorbic acid and citric acid. The brush that comes along in a set is small and portable enough. However, it does not work as well as other big brushes, and is not as smooth. However, compared to last year's collection, the powder grips better and it creates more visible colour swatches. The limited edition blusher comes with a limited edition packaging as well. 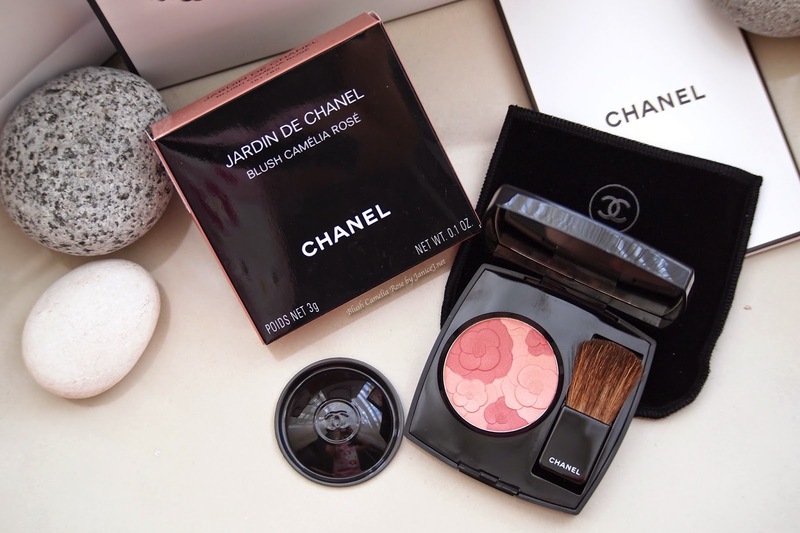 Different from other Chanel products, the JARDIN DE CHANEL BLUSH CAMÉLIA ROSÉ comes in a black and soft pink box. 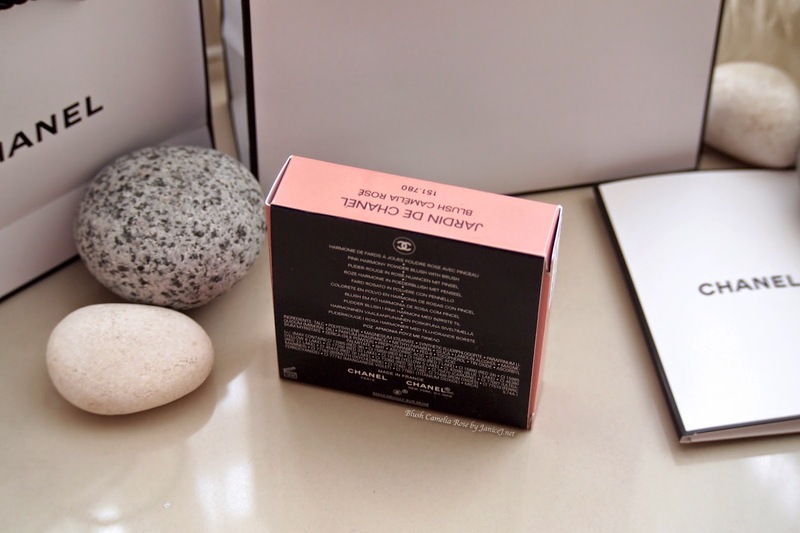 Like other blusher of Chanel, the little smooth shiny black box is protected by a suede cover. It will not get scratches even if you pack it in your bag surrounded by keys, or your makeup bag. 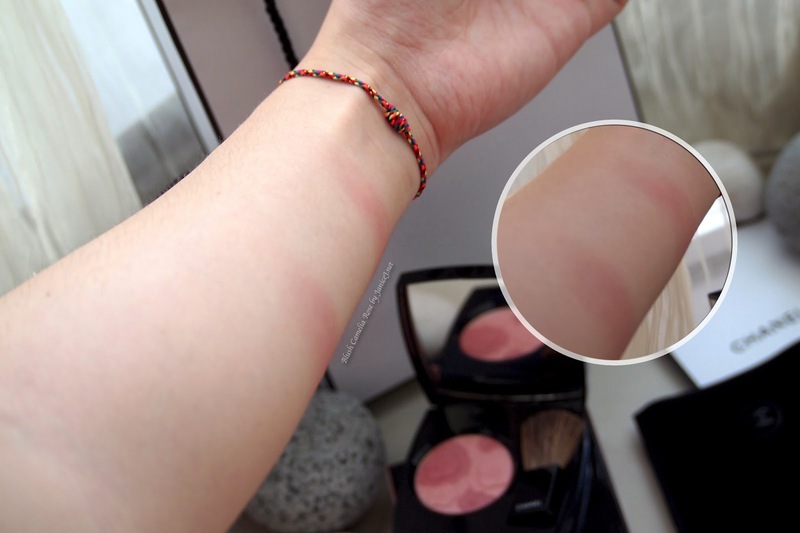 A simple push button on the front side of blusher open it up easily. The black circle cap looking plastic is to protect the content. Also, it helps to prevent dirtying up the mirror. Mentioned above, the blusher comes with heavenly smell. It might be bad for people with sensitive skin or fragrance allergy, but it is good for other girls who likes to smell good. It has the signature Camelia smell. The one nearer to my wrist is a lighter swatches, where the further one has one or two more swatches on. I hope you can see the difference of them under bright natural sunlight and darker indoor lighting. The colour can be use separately as well, to highlight the cheekbones and create shadows with the darker shade. 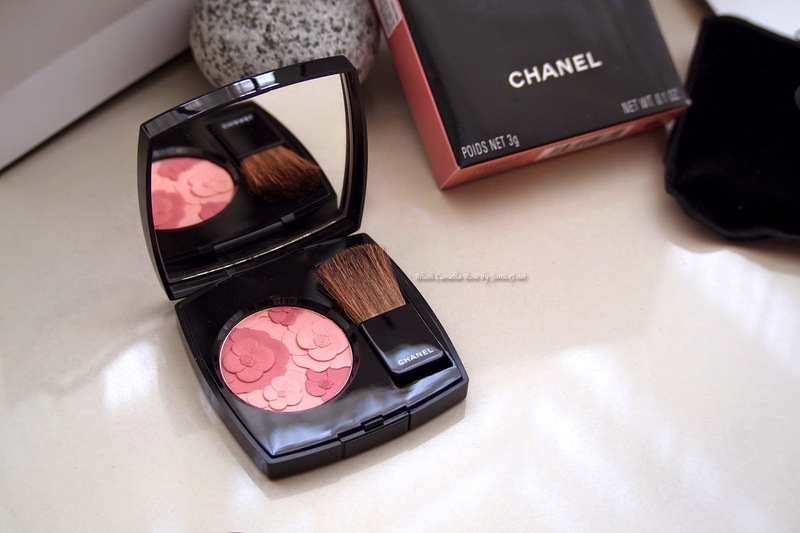 If you are lucky, you might still be able to grab one of this Limited Edition darling from Chanel cosmetic store. It is priced at RM163.